I don’t normally buy the floppies anymore but decided to give this debut issue a look. The $3.50 cover price might give you a moment of pause, but that price is a steal considering that you get 48 pages of story and Marvel and DC routinely charge $3.99 for 20 something pages. Not to mention that all 48 pages are story with zero ads! I don’t consider myself any sort of expert in paper quality, but this seemed like better quality than your standard DC or Marvel release as well. But after consulting with myself, I seem to be of the opinion that most of the Image books I read could also make that claim. The exterior and interior pages are of the slick finish variety with the cover being just a bit thicker than the pages. Bonus points for no ink smudges on the book or my fingers when I was finished reading. 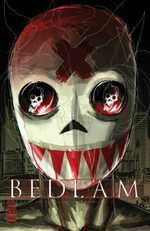 Bedlam is the place in which the book’s story takes place and I’m sure a description of some of the moments as well. The tag-line on the cover reads: “Is evil just something you are or something you do?” and seems to set the table pretty well. The main focus of the issue is establishing the character Madder Red, a serial killer or super villain depending on how you’d like to label him. Things seem to be happening to him in a few different time frames and the order in which these happened confused me a bit but this feels like it will be his story one way or another. 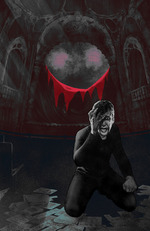 The interior art was provided by Riley Rossmo with colors by Jean-Paul Csuka. I really enjoyed the look and style of this issue’s art work. The coloring is mostly black and white with a lot of red mixed in for dramatic effect. This is certainly not something I’d appreciate in a lot of books but in this case I think it is a great choice and it really helps to set the tone for the story. I think that most of the current top books with Image have a certain artistic style that help them stand out from other titles and perhaps this will be “the look” for this series as well. Nick Spencer is handling the writing for this series and I think a good bit of the buzz surrounding this issue’s release is because of his successes with titles like Morning Glories and Thief of Thieves. Having recently been announced as the writer for the soon to be relaunched (again) Ultimate X-Men series, my guess is that the buzz surrounding his books will continue to grow. Even with the art style standing out in this issue, the writing does not take a back seat, in fact at times it seems pretty dialogue heavy. But I don’t mean that in a negative way, because for me the best moments in the book are in these word balloon heavy dramatic monologue scenes. And I think those scenes make me want to continue the story more than anything else this issue had to offer. As the pieces to the lead character’s puzzle become clearer (hopefully) in the issues to come, I might even look back on some of my confusion as a better set-up than I do right now. This is not a perfect first issue, but it is a very nice start of what could be a very interesting series given the advertised premise. The subject matter does interest me, especially since you are not likely to see them covered by a name brand with a name villain. No big complaints from me here and major kudos for the page count and lack of ads in the book. I wish more titles from any company would go this big for their debut issues. I give this first issue a thumbs up with the idea to check back in with it after the first trade is released. It didn’t knock me off my feet enough to drive me to the shop every month to gather it in single issue form, but then again not much does these days. If you dig the art style and have interest in the concept of evil or the subject of serial killers, I recommend you give this series a look.